What a night! The nights competition, like the previous night, ran until just before midnight. For those that had that little bit of energy left to stick it out it was well worth it. Jason Paule used his usual deft driving skills to slowly tiptoe through the shoot out and barely edge out up and comer Jesse Haines to take the World Champion title. 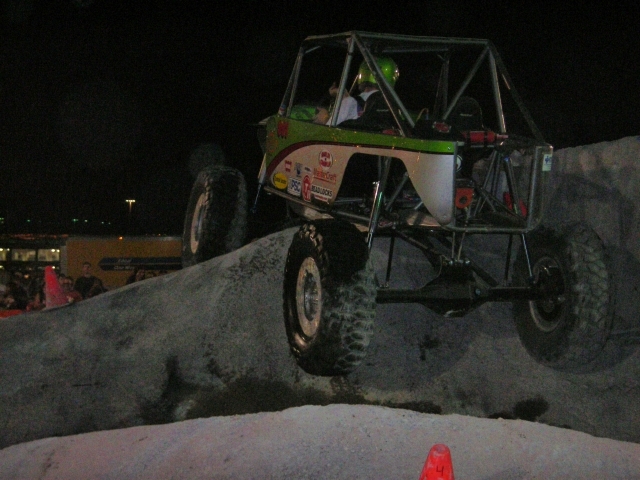 Sam Overton from down under crawled his way up and over in Tracy Jordan's Fabtech buggy to lay claim to third place. When asked afterward what he thought of his first Shoot Out on American soil, he replied, "I was just trying to survive! 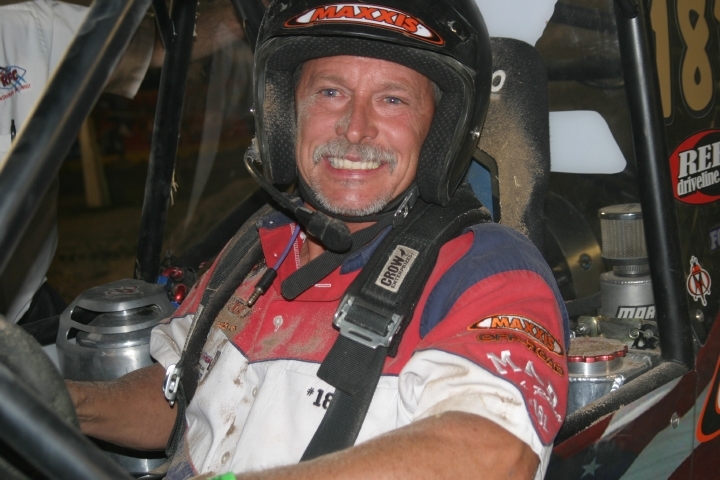 Tracy Jordan is a hell of and driver and has a hell of a rig!" 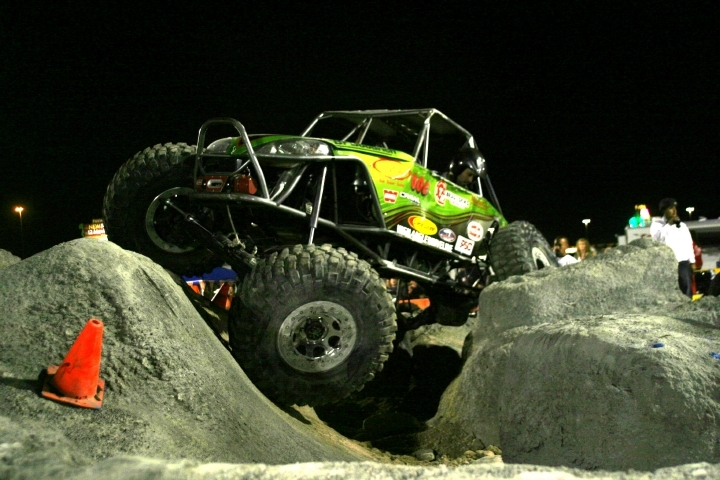 Both Bruce Zeller and Marty Hart overcame course ending roll-overs to claw their way into the Shoot Out for their 4th and 5th place finishes, respectively. 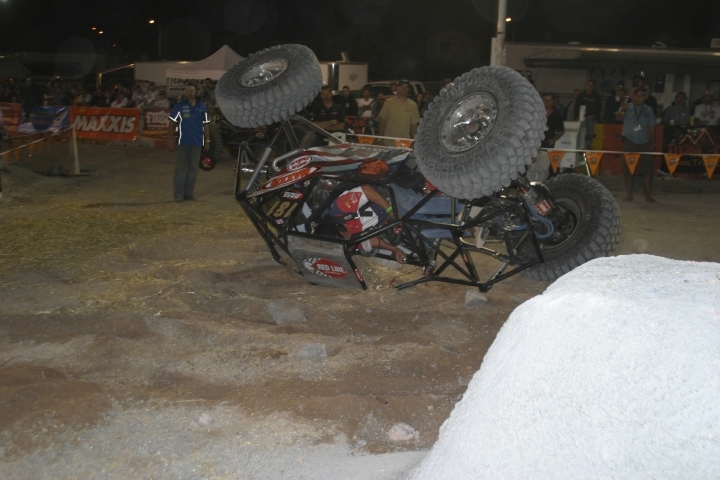 "BZ" took a face full of straw and dirt while trying in vain to right his toppled rig only to be stopped as his efforts DQ'd him when his front two tires spun out of bounds. Marty, in turn, rolled over on the same obstacle only to have a broken fuel line gush the pungent amber liquid out in record amounts before it could be stopped. Ken Blume overcame his own carnage when he took a hard tumble off of a "B" course and ended up dimpling the center of his wheel. When we caught up to him later he expressed his concern about staying within the top 6 for the Shoot Out. "We think we're somewhere in the middle after 3 courses. We're going to have to do some coming from behind, but we can do it. We'll see. I think I have a bent axle so that might hold us up. It's either a bent axle of the axle stub." 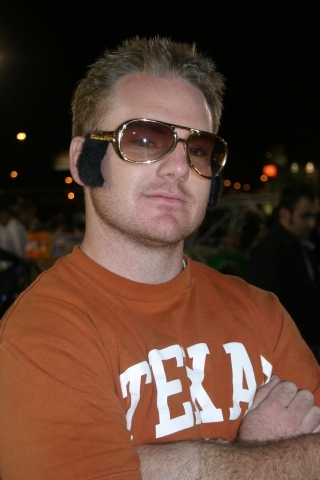 Just like he did in Boyd, Texas, he powered through and planted himself solidly in 6th place at the end of the night. 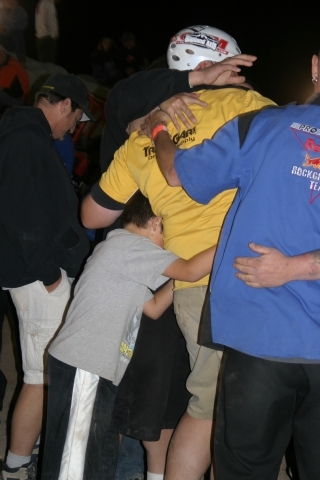 The emotional battle of the night was definitely in the Pro Modified division. Brian Ellinger and spotter, Dave Cole, of Team Slow Speed set out with a purpose. Having tasted their first trophy back at the Grand Nationals by placing 3rd to qualify for the World Finals, they hungered for top honors. Halfway through they had the lead and were adding up scores of their competitors after every run to see how their tenuous 19 point lead was holding up. When the Shoot Out came, they had the top spot which gave them the advantage of watching the other top six behind them try their rig on the final course. Becca and Dustin Webster had fought hard all night long overcoming carnage and frustration to snarl their way into the Shoot Out. Having written off all hopes they were stunned and optimistic about their chances to come from behind. Brian Errea battled the final course like a man with an inner demon losing precious ground to his opponents when he got hung up on his undercarriage for several long, agonizing minutes. Dean Bulloch held a distant 2nd going into the final event and did everything in his power, with cunning assistance from spotter Carl Munford pre-stacking in strategic locations. No one had the resolution of team Slow Speed and their Trail Gear sponsored rig as Brian and Dave gave the dwindling crowd the emotional victory with a nearly perfect run. In so doing they garnered their second trophy ever and their first top honors, let alone the title of World Finals Champions! Dave Cole was so overcome with emotion he was loving everyone and telling them so as he accepted hugs of congratulations. 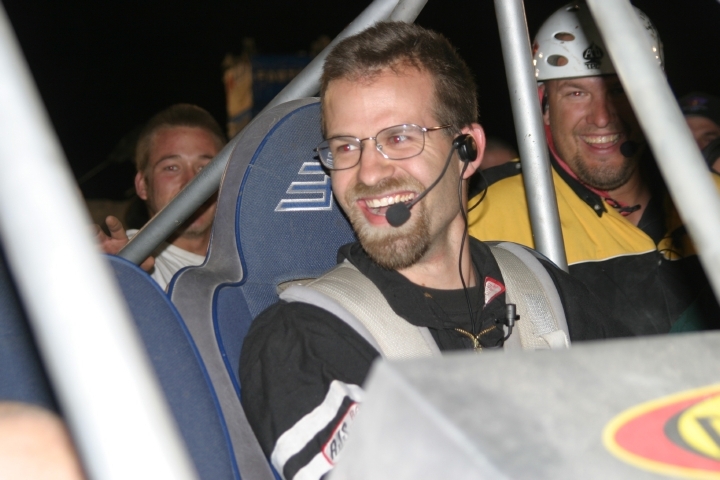 Meanwhile, driver, Brian Ellinger could only say "Yeah!" in stunned elation when we commented, "Now's a good time to be World Champion. 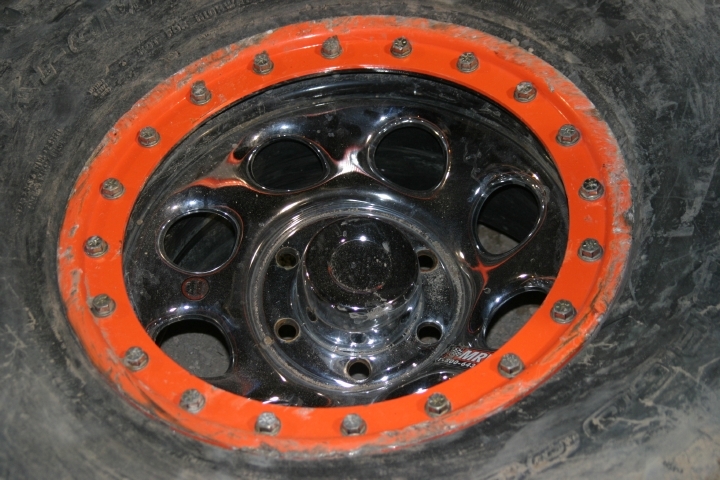 Now that you've decided to stop competing to concentrate on expanding your Diamond Axles sales." Where the Pro Modified actual standings landed as the dust settled last night was not immediately known as W.E. 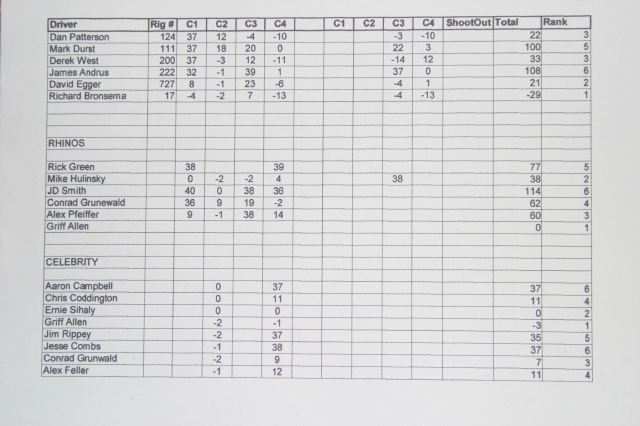 Rock officials suffered a computer glitch and were rebuilding the score sheet for the division. We are assured that Brian is indeed the Pro Modified World Champion for this season. After the Modifies Stock Shootout, Richard Bronsema found himself on top of the heap and the new W.E. Rock World Finals Champion! As an award for good behavior his spotter, Shon, celebrated by writing a check for his new . . .but slightly used, Maxxis Buggy! When in Vegas there are things you think you will never see in your life. Myths get busted . . . Translation . . . Val really does have a husband and IT IS NOT Scott Ellinger! and gone to the W.E.Rock World Finals! God DOES work in mysterious ways . . .
and the Devil adds his special flare! Tracy Jordan wants everyone to know who he is . . .
even if Jason Paule has to do the autographing for him! 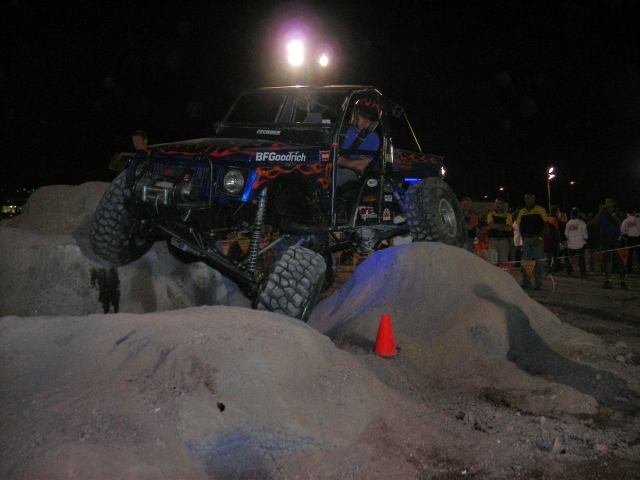 As dusk settled on the Las Vegas suburb known as Henderson, the Modified Stock and Rhino Divisions that had earned an invite to the W.E.Rock World Finals were tech inspected and ready to hit the courses for the final battle of the year. Pro Modified and Unlimited teams, like Becca & Dustin Webster with all of the Red Bull Rigs in tow and Cody Waggoner with his one week old motor still being tuned, were rolling in for their own tech inspections and a look at the event site. Lil' Rich's insane imaginings have once again been built and strewn about. 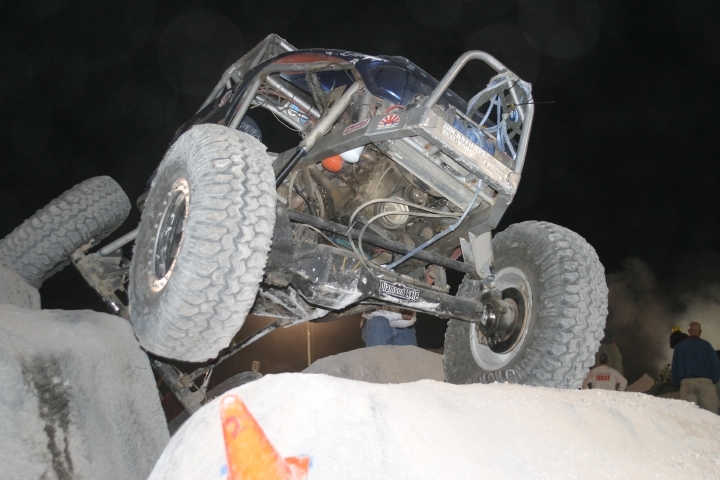 What was formerly just styrofoam, culverts, shipping containers and construction boxes of various sizes were now covered in gunite and a became rolling, twisted mass of courses that the teams would have to crawl, skinny pedal, tumble and fineness their way through. 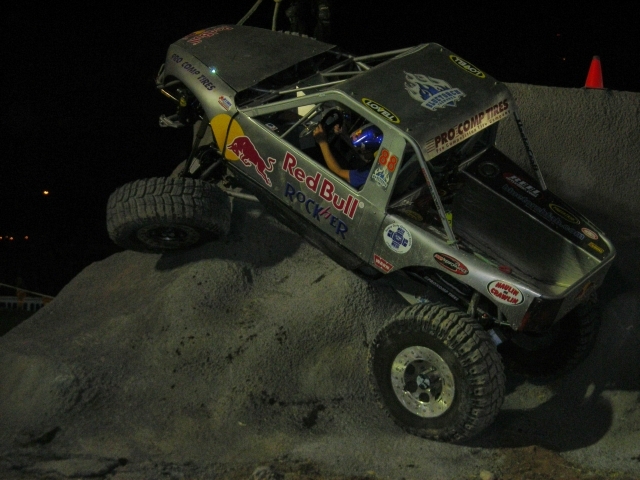 The first night of competition started with carnage occurring just past the entry gates in the Rhino class as Rick Green had steering issues a mere 15 feet into the coarse and had to call for recovery. He wouldn't be the only one to fall victim to "Break Down Time" as Derek West in the Modified Stock division sheered his lugs shortly into one of his first courses Team efforts by flashlight got him back on track with only one missed coarse. Lighting is definitely an issue. While there are many portable gas lights scattered around the courses, the visibility runs from bright to very dim on each course. This challenge is making the teams struggle as well as photographers and spectators. One thing no one misses however is hot chicks. At least you would have had to be blind to miss the ESPN representative amongst this crowd of seasoned competitors. 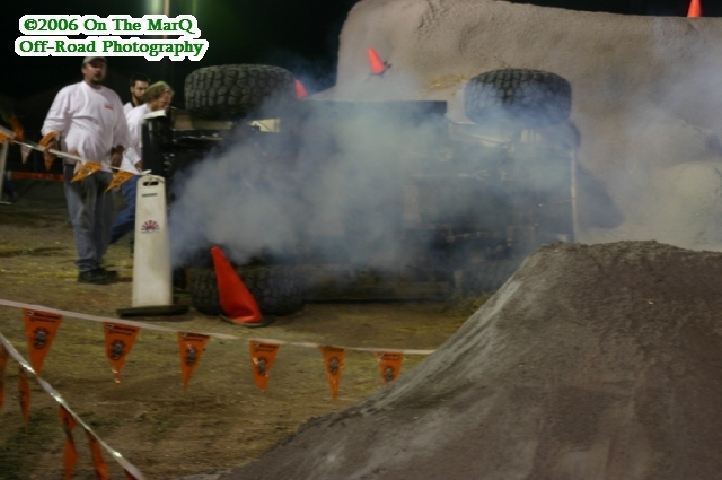 Even in the dark, rollovers happen. While, no one did any try-outs for the Olympics gymnastic team, they did topple over onto their sides and most were not able to recover. In the Celebrity Shootout, some folks who spend time competing in other sports or just plain talking about this sport took their hand behind the wheel with some seasoned vets spotting them through two courses. 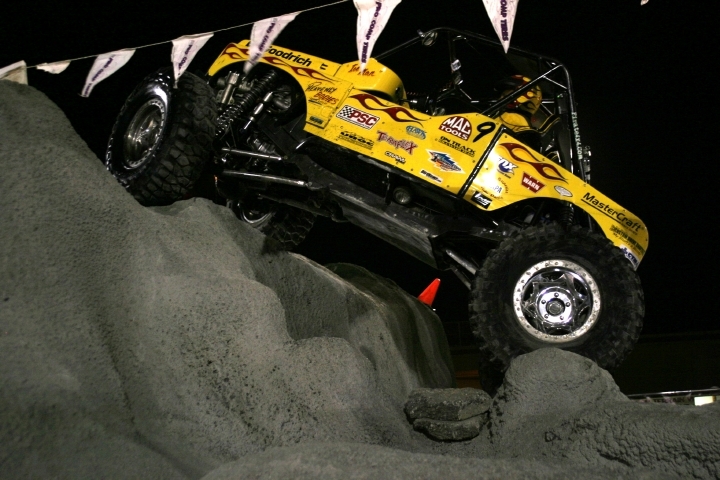 Extreme 4x4 TV's own Jesse Combs tried her hand at the wheel while Dave Cole spotted her through the courses. The Fiesta Casino's own Ernie Sinaly took his turn with Dustin Webster spotting. Ken Blume traded in his steering wheel to spot for Aaron Campbell of Low Range magazine. We heard Ken's steady voice guiding his driver flawlessly through the first course. On the second course we overheard him telling Aaron, "I'm going to take you deep and then back off a little." Later on, a little bit of over use on the skinny pedal would get them solidly centered on top of a ledge they would not recover from. After word, Aaron told us, "Ken wanted me to stop so he could stack some rocks and I thought we should just go for it. I knew in my gut that's what we should have done, but Ken is the professional and I listened to him. I should have trusted my gut." Ummmmm, Aaron your foot should have listened to Ken. The rock stacking would have worked for your team like the others that tried it! As for scores . . .
A picture tells the tale. If this picture isn't enough then check out the gallery. 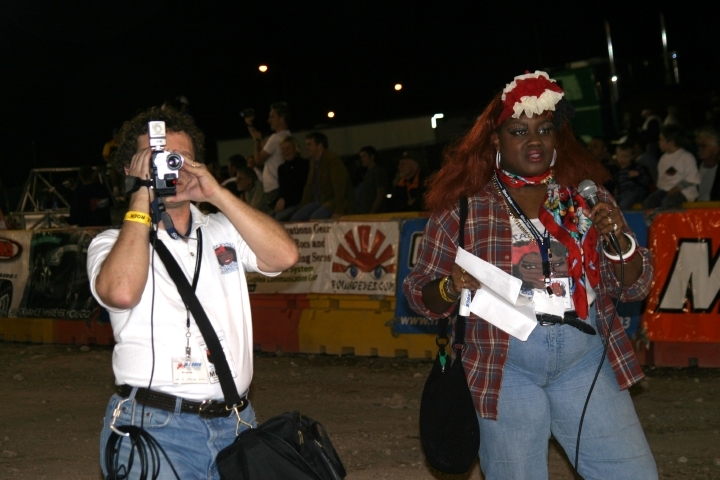 There are over 900 pictures of all the action. 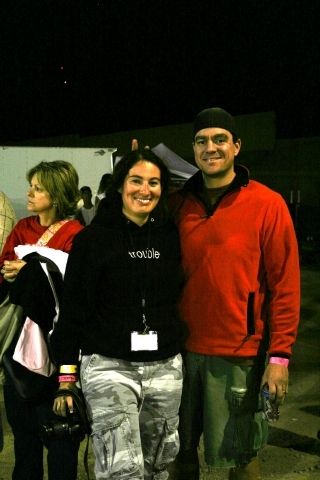 Some are even really good as Kelly Marquis and his wife, Kim, are helping us cover all the action.